"Ziles Uznemums" Ltd offers you products made of more than 20 kinds of trees. We do not face any processing restraints and perform processing at any difficulty level starting with simple shaved board and including the finest woodcuts. 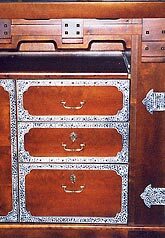 We can choose any tone and degree of varnish shine. We will equip your furniture with fittings produced by different companies and, if necessary, produce fittings on special order. We complete products with glass and metal elements supplied by reliable co-operation partners. In the production, we use only certified glues and decoration materials and in special cases also certified wooden materials, thus ensuring superior quality and longevity for the furniture.